Last Saturday night will long live in my memory. We were guests at a very special occasion, the 125th anniversary party of Coca-Cola on Liberty Island which coincided with the 125th anniversary of the Statue of Liberty. I had never been to Liberty Island despite living in New York a quarter century now, and it is more my shame. Perhaps because it was the week that was in it with the Osama bin Laden operation and the sense of America pride restored, but it was a night to revel in the symbolism of the occasion and the sheer good luck of living in this country. It was a beautiful New York spring evening, with a breeze from the south gently wafting across the harbor. The guest list for the event was impressive indeed, but judging by the nudges and looks will.i.am of the Black Eyed Peas was very much the man of the moment. Masters of the universe like New York Mayor Michael Bloomberg, media mogul Barry Diller and his wife, the designer Diane von Furstenberg, and Goldman Sachs CEO Lloyd Blankfein were also present, but all were upstaged by the lady of the hour. Lady Liberty looked stunning up close as we approached the island. I had often passed her on the Staten Island Ferry or on various cruises but had never been this close. Walking around the island, I was struck by the vision of Manhattan I saw in the distance, my familiar city viewed from an unfamiliar vantage point. The eye was immediately drawn to the new Freedom Tower, now beginning its climb to the night sky where it will once again signal America’s determination to move on past 9/11 and rebuild and retrench. On a week when the perpetrator of mass murder on that very site got his just desserts, it was a fitting coda to the evening. We dined in a specially constructed tent with a glass roof so it seemed, the lady with the lamp was looming over the entire event. 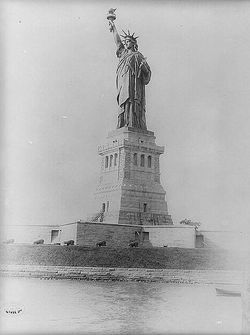 It is easy to over-sentimentalize her, to fall prey to the clichés, but when you are up so close that you can touch, you see the golden lamp and you feel the generations who saw her and cried because they knew they had come to America. This is a country of emigrants. The CEO of Coca-Cola, Muhtar Kent, was born to Turkish diplomat parents in New York but returned to Turkey at a very young age. As a young man he returned with $1,000 and a dream and joined the Coca-Cola Company at the entry level. Now he runs the best-known corporation on Earth. It was fitting that he was able to address what the Statue of Liberty meant to him and other immigrants, and children of immigrants. Years ago I went to Ellis Island and traced my grand uncle, who ended up as a fire chief in San Francisco, and his path through Ellis Island. They say over 100 million Americans can trace their ancestry to that very spot. The Irish touch was a nice one. Former Coca-Cola President Don Keough was not present, but he has infused a sense of Irish American identity with Coca-Cola over the past few decades. The fact that the company is one of the major employers in Ireland also helps. All in all a wonderful night, highlighted by the classy anniversary, Lady Liberty and also a powerful grace note by Bloomberg in his speech praising the role of immigrants.